We’re starving for information, dying to buy into certain trends or indicators. We’re still very much in nonexistent sample territory, though. Mostly, we’re relying on our preseason opinions on players and playing favorable matchups. Results aren’t particularly meaningful right now. That said, we can look for process changes. Which players are doing certain things differently than they used to? Which hitters are hitting the ball harder than expected? We’ll start with an up-and-down hurler who seems to be embracing a modern trend: use your best pitch early and often. “Opposing hitters made contact on only 60% of their swings against Rodon’s slider, making it easily his best swing-and-miss pitch. Nevertheless, he only used it around a quarter of the time, relying on a more traditional, fastball-heavy approach. 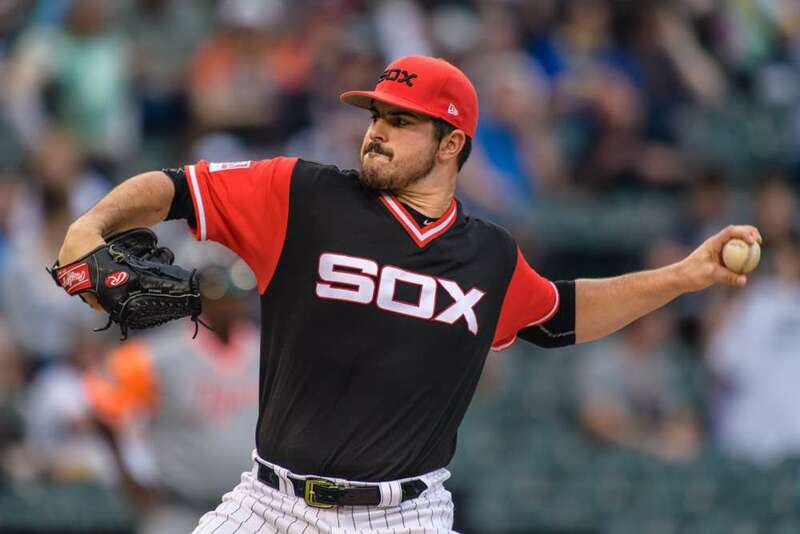 Rodon has almost abandoned the changeup, embracing a near 50-50 fastball-slider mix. This has been especially true when Rodon’s ahead in the count, and, not coincidentally, he’s been finishing hitters off in two-strike counts so far. 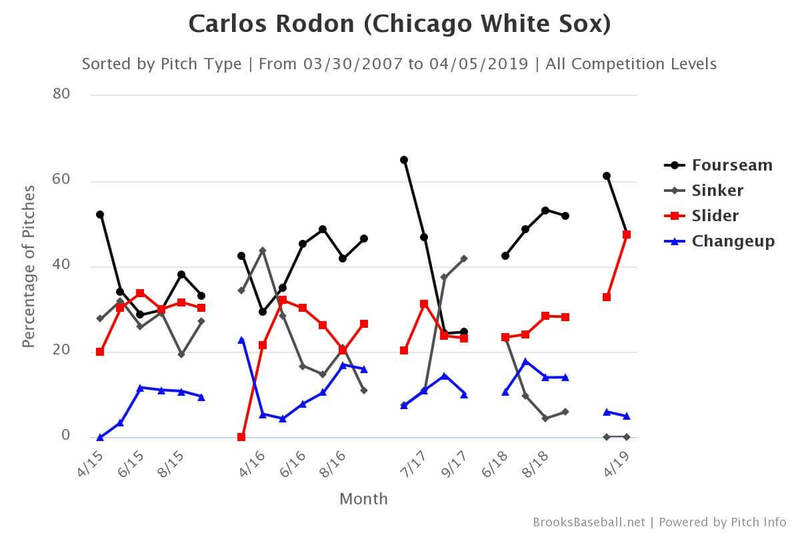 There’s some chance he becomes too predictable, and the slider loses its effectiveness as hitters begin to sit on it, but we can say for sure that Rodon is a different pitcher than he used to be. That’s about as definitive a conclusion as we can ever draw from a week of baseball. Donaldson fell in drafts based on concerns about his age and health. That happens when you slog through an injury-ravaged age-32 season. It wasn’t just fantasy owners who were wary. Donaldson got a very lucrative one-year deal as a free agent this offseason, but it was still a one-year deal. Had he put up a typical Donaldson season, he’d have probably been looking at three or four years. So, how does Donaldson look so far? Well, he’s hitting .182 without an extra-base hit, so in that sense, not great. Yet we know that results this early don’t mean much. Last season, Donaldson returned from a calf injury in September. That entire month, he had all of one batted ball harder than 108 MPH, the proxy for an extremely well-struck ball. He’s already got two in the opening week of this season, including a 113 MPH single off Kyle Hendricks. Donaldson might be in for some age-related decline this season, and it’s probably fair to take the under on his projected .261/.369/.486 with 25 home runs, but he looks healthier again. He’s swinging the bat with more authority, at least. Oh, and next week seems as good as any for the results to follow. Atlanta takes a three-game trip to Coors Field to start the week. Facing the Rockies’ talented pitching staff isn’t easy, but getting a huge field to work with and thin air might get Donaldson’s power numbers going. After that, the Braves host the Mets for three. On the surface, that seems a tough matchup, but the Mets’ rotation seems to be lined up so that Atlanta will dodge at least one of Jacob deGrom or Noah Syndergaard, and quite possibly both. Getting a crack at lefties like Steven Matz and Jason Vargas might be a boon for the right-handed power hitter. The breakthrough might be imminent. Speaking of right-handed power (and New York’s Senior Circuit squad), Statcast confirms what we all knew: Pete Alonso’s a very strong man. Here are the owners of the Amazin’s five hardest-hit balls of the 2019 season: Alonso, Alonso, Michael Conforto, Alonso, and Alonso. In 2018, the Mets’ leaders in batted balls hit 110 MPH or harder: Todd Frazier and Jose Bautista, with five apiece. It’s been a week, and Alonso’s already got three of them. None of this is surprising, really. He showed eye-popping exit velocities in the 2018 Futures Game, and scouts were putting 80-grade raw power on him. This is what top-of-the-scale power is supposed to look like. Still, it’s encouraging that Alonso’s getting to that power in games so quickly. What’s more, he’s demonstrated an ability to generate that power effortlessly to all fields, with rockets to left, center and right already. Alonso will probably strike out quite often, but we can say with even more confidence than we could a week ago that Alonso’s power will play. He’s a true 30-homer threat as a rookie.